This novelette from 1931 involves a mathematical physicist whose theories get applied by an experimenter. He and his beautiful daughter get trapped in an alternate dimension with “bad guys” called the Ragged Men. A mathematical genius is called in to find a way to rescue them while fending off a crooked lab assistant and a gangster who wants the technology for his own purposes. 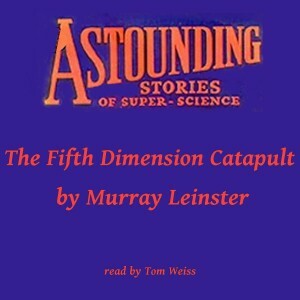 The Fifth Dimension Catapult is the prequel to the Fifth Dimension Tube, also available from Audible.